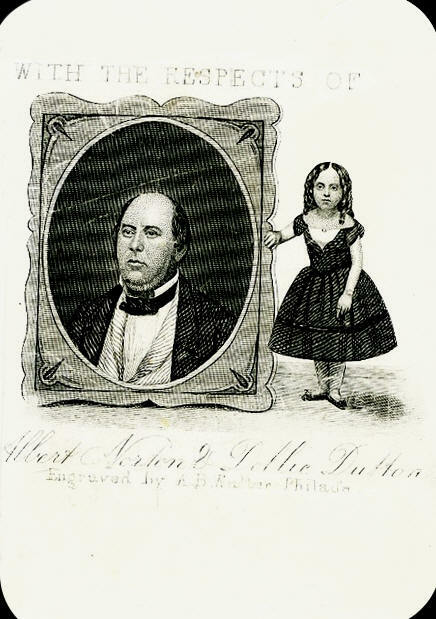 "Another dear friend of Lavinia's was the tiny midget, Dollie Dutton. Dollie was born in Framingham, Massachusetts in 1852, into a normal sized family with the exception of one sister. The father, mother, two brothers and a sister were all of usual size, but one little sister never grew to be more than thirty inches in height, nor more than fifteen pounds in weight. The sister died at the age of eight years, but before her death the two little midgets made many public appearances together. "A relative of the family remembered seeing Mr. Dutton go down the aisle of a circus with arms outstretched, holding one in the palm of each hand, Dollie and her sister. A ring worn by Dollie fitted the finger of a year old infant and an oval bracelet that belonged to her scarcely encircled the finger of a normal sized person, looking more like a ring than a bracelet. 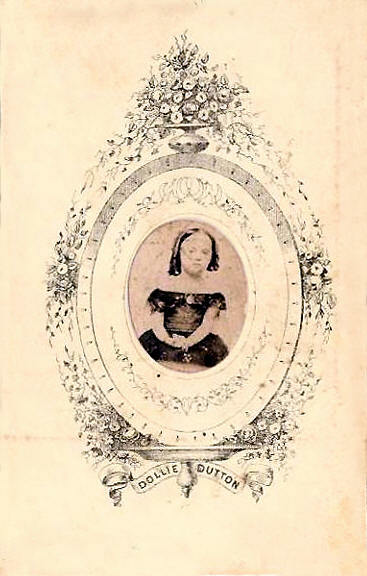 A ticket to one of Dollie's exhibitions read, "Levee of the Little Fairy, Miss Dollie Dutton." A little sofa and side chair used by her could well serve as doll's furniture, measuring in height the length of a new lead pencil. 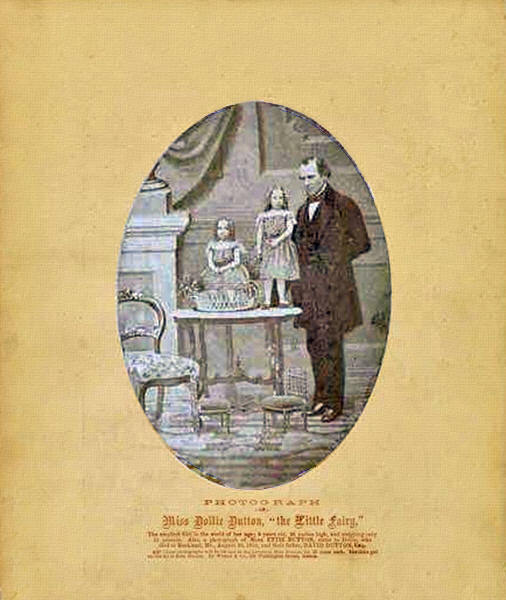 "Dollie often traveled with the Tom Thumb troupe. At thirty years of age she was thirty-nine inches tall and weighed fifteen pounds. She married a normal sized man, Mr. B Sarvin, and had a baby boy who weighed at birth one pound and two ounces, but who lived only a few hours. Dollie died in Natick, Massachusetts, on June 6, 1890, aged thirty-eight years."